Picky Eaters in the House? This Book Can Help! Feeding kiddos can be a stressful endeavor; I know because I’ve certainly stressed about it. I’m constantly wondering if my daughter is getting enough variety, enough iron, enough calcium, enough fruits and veggies. As of now, she’s not a very picky eater, so she’ll eat much of what I offer. But I can only imagine the frustration and worry when all your kid wants to eat is chicken nuggets and macaroni. Luckily for parents of picky eaters, a new book has arrived to help solve your problems. 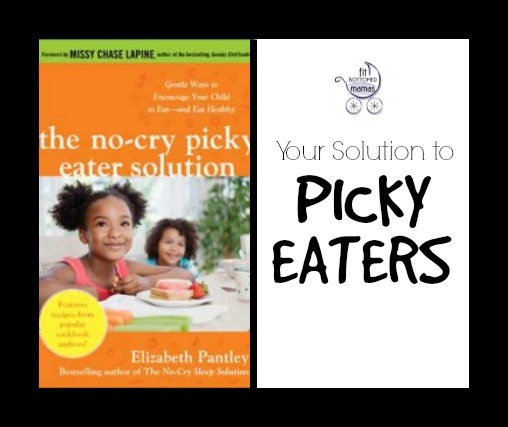 Elizabeth Pantley—whom I give much credit in helping me get a better night’s sleep after an eternity of no sleep—has come out with a nutritional version of her successful sleep book: The No-Cry Picky Eater Solution. What I love about the No-Cry books is that the author doesn’t just tell you how to get the quick fix. She goes into the background of why kids are picky eaters and that it’s a super-common problem—not just weak parents bending to their kids’ stubborn will. She also gives parents nutrition basics, such as buzz words that mean sugar, facts about soda and family meals, and the importance of fruits, veggies and whole grains. Basic, good info for every parent. Like the sleep solutions book, this one includes tips and tricks that can help parents desperate to change the nutritional game. Questions and answers that address common picky eater problems will not only show you that you’re not alone but will also give you solid, reasonable options to try with your kids. I love the ideas about gradually increasing the nutritional value of a picky eater’s staple like PB&J on white with a half white, half wheat sandwich. Genius. Healthy recipes at the end of the book will have you adding a few more options to your rotation as well.